Can you imagine being called a Doubter for 2000 years? Thomas was also a Twin, but no one calls him that. Can you imagine showing off the family photo album? This is Laura, who married a nice boy from Bethany; here is Terrence—he runs a sheep-shearing business in Jerusalem; and that one’s Terrence’s Twin, Thomas —well… He’s a Doubter. What does a guy have to do to get a new reputation? Well, maybe Thomas' time has finally come. The other disciples (in John 20:19-21) have experienced a miracle—Jesus, risen from the dead in the flesh and speaking to them. But Thomas wasn’t there—Scripture doesn’t tell us where he was, but I suspect that he was working. I’ve lived in Missouri for 23 years and the first thing I learned was that this is the “Show Me” state. Missourians are people who say, don’t tell me – show me! And isn’t this the very nature of our tradition as Lutherans? Martin Luther himself said to the Roman church in the 16th century: Show me! Show me where indulgences, purgatory, & popes are in the Scripture? Instead, Martin Luther showed that we are saved by grace through faith and not by our own work or merit. All of which is to say, that Thomas is not a Doubter – he’s a Lutheran from Missouri! Thomas doesn’t want to be told what to believe—he wants to experience it for himself. He doesn’t want to take something as serious and life-transforming as Jesus resurrected from the dead on the word of someone else—especially when those someones are too scared to leave the house. He wants to touch, see and hear Jesus himself—“show me!” Thomas says. Thomas needs a real relationship with the risen Lord. Thomas’ desire to experience Jesus for himself gives us a crucial window in how to be the church and carry out mission in the 21st century. Since the Reformation in the 1500’s, we have lived in what historians call the Modern Era—the Age of Enlightenment, the Age of Reason. Scientific understanding and methods, the power of logic, and tools of discovery have fostered the belief that that we can not only gain knowledge, but we can know THE truth—Truth that has authority in our lives. We trusted the authority of denominations, government institutions, scientific experts—we sang, Jesus Loves Me This I Know, for the Bible Tells Me So and that was good enough! But now, as we began the 21st Century, we are leaving the Modern Era and entering the Post-Modern Era, even a Post-Christian Era. • Truth claims no longer have the power they once did. • and the church no longer holds a central place in our culture and in people’s lives. Younger generations today are very much like Thomas—they say to us, Don’t tell me what to believe, show me! Don’t tell me about God and your faith, I want to see, feel, hear and experience it for myself. I’m not going to believe because the church or a book of ancient texts tells me to, Show me! Show me—not in a building or in an institution—beautiful and wonderful as it may be—show me out in the world—show me in your daily life. Notice in our Gospel story, that Jesus offers Thomas exactly what he needs in order to believe in him! Put your finger here and see my hands. Reach out your hand and put it in my side. The resurrection is real, Thomas, you can believe! I am here to make a relationship with you! Jesus also shows up for the other disciples too-even though they still seem to be locked in a room with door shut! Whether we’re locked up inside and afraid to go into the world, or whether we are like Thomas, saying, “unless I experience it myself, I won’t believe”—the good news is that Jesus appears to us to show us the resurrection is real. He loves us into a relationship with him. Then Jesus says, Peace be with you. As the Father has sent me, so I send you. And he breathes on us the Holy Spirit—all the power we need to go out through the doors and into the world, helping people experience that the resurrection is real! Church tradition tells us that Thomas brought the Gospel through Syria, all the way to southern India where congregations in the state of Kerala trace their beginning back to the witness of Thomas! Far from a Doubter, Thomas is the Patron Saint of our Post-Modern Era! The world will continue to change around us, but remember, we are Lutheran Missourians! Millennials, the Nones, the Spiritual but not Religious—that doesn't intimidate us. We’re all about that Show me-faith, Show me-resurrection, Show me-Jesus in the world. That’s our bread and butter! Jesus calls us to follow him in giving the Thomases of today, the relationship with God that they seek, and the experience of the risen Lord that they crave. And that relationship begins with you and me. For this generation, the need to have a relationship and sense of belonging (which is not the same as "membership!") first and then they begin to believe (whereas in my generation, we believed in God and then found a place to belong). Young people today want to be involved in hands-on mission and service in the world and they seek authentic community. Terrific! We're experts at this! The congregation I'm serving as an Interim Associate Pastor has a community garden, they're taking youth on a mission trip this summer, they have a school that builds a relationship with Jesus as well as teaches knowledge, they give out sack lunches for members to give to people in need, they serve breakfast to the homeless every month, they have a Service Day coming up on Saturday, April 23rd with a group called Congregations in Service and the list goes on! All we need to do when we encounter young people waiting on us at the Starbucks or the Jiffy Lube, or when we talk with our kids or grandkids’ friends, is to build a relationship with them. Get to know them and what they’re passionate about, what worries them and what they want to do about it. Then invite them to participate in the community garden, or serving the homeless breakfast, or Service Saturday or whatever interests them. They’ll enter into a relationship with Jesus and come to believe in God, when we love them and show them how faith gets lived out in the real world. 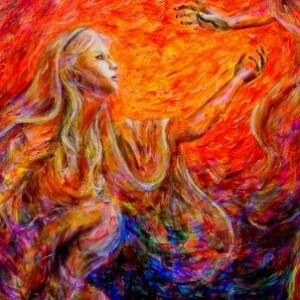 We have all heard the phrase, “It’s not what you know, but who you know.” This was certainly true for Mary Magdalene in the Easter story in John 20. For until she met Jesus, she didn’t know anyone who took her seriously—who listened to her, who valued her, who loved her. Mary Magdalene was streetwise and independent. She knew how to survive in a man’s world. She knew how to make things happen. But it didn’t matter what she knew in the eyes of the privileged and the powerful of her day—she was a nobody. Mary did not know anybody who loved her just for her until she met Jesus. For Mary Magdalene, it really was true—it wasn’t what she knew, it was who she knew that made the difference in her life. But now that “who”—Jesus—was dead, and her life was turned upside down. This is why Mary went to the tomb so early that morning. She couldn’t imagine life without knowing Jesus—without the one and only meaningful relationship she had ever had. Mary Magdalene rose before the sun on that first day of the week to go to the tomb to grieve the one she had lost. Mary gingerly picked her way through the darkness of the pre-dawn, with tears in her eyes and grief in her heart. • she heard Jesus himself say a number of times that the Son of Man would be killed and 3 days later rise again. Mary has all the information she needs to trust that Jesus is actually alive: in addition to an empty tomb, folded grave cloths and angels; Jesus himself stands before her and speaks to her. But the evidence before her isn’t enough. It’s not what she knows about resurrection, and now it’s not even who she knows, since Jesus is right in front of her. Mary is more confused than ever, thinking Jesus is the gardener! So what is it that finally makes the resurrection real for Mary? I did not fully understand what it was until my husband’s Grandmother had a series of strokes and we traveled to Philadelphia to visit her. We learned that Grandmother wasn’t doing well—her memory had been damaged and her activity was severely limited. Dan knew he couldn’t expect much, if anything from this visit. He didn’t know if she would even know who he was. In that moment, it didn’t matter what Dan knew about her condition; it didn’t matter who she had been for him. What mattered was that he was known—known by someone he thought he had lost forever. In that familiar voice, Jesus looked at her and said, “Mary!” Only when she was known by Jesus, did the resurrection become real for her. We’ve all come to Easter looking for something. We have all come hoping to make sense of Jesus’ death, hoping to discover some truth about God, hoping that, for us, the resurrection might be real. But we're really looking to be found—to be completely known by the Savior who calls each of us by name. We came to restore a relationship that we feared was lost—perhaps we haven’t been praying or haven’t been to church in a long time, and we thought our chance with God was gone. Or perhaps we go to church every Sunday, but never really believed Jesus died for us. We each came today to be known intimately by name, by Jesus. And strange and wonderful things happen when we’re known by the Lord. We’re filled with a deep and exuberant joy! • A joy that makes us run with Mary to go and tell others that Jesus Christ is indeed alive! Photo Credit: "Noli Me Tangere" (Stop Clinging to Me). Painting by Nik Helbig. Acrylic on Canvas, based on classical biblical theme of Mary Magdalene and Jesus. Connect with Nik Helbig on Facebook. When I was a kid, I wondered why in Holy Week, we had a Monday Thursday. And if today is Monday Thursday, then why isn’t tomorrow Monday Friday and Easter, Monday Sunday? I thought Monday was the least favorite day of the week, so isn’t one Monday enough? It probably wasn’t until I was in seminary that I learned the name “Maundy Thursday” comes from the Latin word, Mandatum, which means “command.” Jesus gives his disciples a new commandment on Thursday of Holy Week, so it is Commandment Thursday, Mandatum Thursday, which has over time, has been compressed to Maundy Thursday. We see this during Jesus’ time when those with the leprosy or other diseases were forced to be outcast. The religious laws banished them from the community because they were unclean. In fact they had to yell, “unclean, unclean” when walking near anyone so people could keep their distance. They would become unclean by touching an outcast, so they banished them first. We hear the Iron Rule in some of today’s political rhetoric that promises to prevent Muslims from coming into the country and to enact aggressive neighborhood surveillance of Muslim communities. Fear leads us to do unto others before they do unto us. The next level of relationship Sweet identifies is the Silver Rule--Do unto others as they do unto you. The Silver rule works well when everyone is operating positively and generating good will. You scratch my back and I’ll scratch yours. It’s a transactional relationship that works until our fallible nature gets the better of us. Then it quickly becomes an eye for an eye and a tooth for a tooth which can lead to revenge and vigilantism. I think this is why we love movies like The Godfather which dramatize organized crime. There’s always an accounting of who did what to whom and who pays the price. The Silver Rule can also excuse us from ever taking initiative, offering a loophole for people who never want to make the first move. If we don’t trust others, we hang back, only responding to others based on how they treat us. Then we move up to the Golden Rule – and every major religion has a version of Do unto others as you would have them do unto you. Treat others how you would like to be treated. We all learned this in elementary school, and I think we’re all the better for it. We hear the Golden Rule in Jesus’ summary of the two greatest commandments in the Gospels of Matthew and Mark: the greatest commandment is to love the Lord your God with all your heart and soul and mind, and your neighbor as yourself. We just visited Knox College in IL with our daughter earlier this week and one of the values there is the Honor Code. This allows students to take their tests anywhere they like—under a tree outside or in a study carrel in the library—without a professor present. This principle is based on the Golden Rule—the faculty invests in the students the same honor and trust the students accord them. There is a drawback to the Golden Rule, however—it’s limited by our own imagination. We have a hard time imagining people’s needs and desires when they fall outside of our own culture or experience. So the Golden Rule can break down, especially in cross-cultural situations. The way we like to be treated may not be appropriate in another cultural setting. So Leonard Sweet then identifies the Platinum Rule which says, Do unto others as they would have you do unto them. The Platinum rule requires investment in a real relationship and true listening. We have to get to know the person in order to understand what’s important to them, what they value and how to communicate on their wavelength. The Platinum Rule is something we all do everyday because it’s important in all healthy relationships, from friendship to marriage, to parent-child relationships to cross-cultural dialog. We hear Jesus do this very thing when Blind Bartimeus begs him for mercy in John, chapter 9. Jesus asks him, What would like for me to do for you? Jesus engages in relationship instead of making assumptions about what Bartimeus needs and wants. Asking this question, What do you need us to do? has been an important task of the Ferguson Commission that was set up in the aftermath of Michael Brown’s death. In order to build a just society, we need to really listen to what African Americans, especially young men, are experiencing in our law enforcement and justice systems, most especially when it’s different from our own experience. Which brings us to today, Maundy Thursday, when Jesus ups the ante on all of our human relationships with a New Commandment. What does it mean to love as Jesus loves? 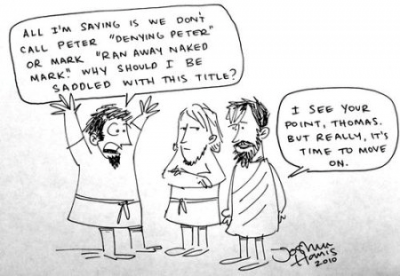 To do unto others as Jesus has done to us? On this night Jesus eats his last meal before he dies. He invites his disciples and closest friends to celebrate the Passover meal with him. Try to imagine it. • Jesus knows Peter will deny him, not once, but 3 times. • Jesus understands that Judas will sell him out. • Jesus knows all of the disciples except John, his Mom and a few women will run away when he needs them most. • He’s facing a painful death knowing that most of the people he’s close to will abandon, deny and betray him. If it were your last meal on earth would you invite these so-called friends to join you? How do you face the most difficult and painful hardship of your life knowing everyone who’s close to you will fail you? Personally, I would want to ask them to leave before dessert, so I could take solace in the whole chocolate raspberry cheesecake. But, what does Jesus do? He invites them to share the bread, enjoy the wine, and eat their fill, dessert included. Jesus invests the last energy he has in nurturing relationships with fallible, broken, fearful people. And Jesus doesn’t stop there. He dives even deeper. • to indulge the ones who don’t show up when you need them most. Loving our enemies is not enough. People will know that we are Jesus’ disciples when we serve and care for those who fail us. Maybe Monday Thursday is a good name for today because this may be our least favorite commandment. Imagine washing the feet of your nemesis, your political polar opposite, your ex-whatever- ex-friend, ex-spouse, ex-boyfriend. That’s the Titanium Rule that shows the world whom we follow. Others’ behavior has no bearing on our behavior and choices—choose love, choose service, and choose forgiveness regardless of how others act. How can we do this? There’s only one way. By coming to the table of the Lord's Supper where Jesus invites us to participate in his life, be filled with his love, partake of his body. Jesus says, this is my body, this is my blood – This is myself - I give you myself – I give you all that I am. And he already knows—he already knows that every one of us will abandon, deny and betray him in one way or another this week—yet he says, Come. Come to the table, let me serve you with my very life, let me love you, even and most especially your fallible, feeble, fearful souls. And then pass it on, pay it forward. Let someone see that I love them because you show up to serve, to love, to forgive. Jesus says, Love as I love you. Go from this meal and pass it on. It was the fall of 1980 and I was a freshman in college. I wanted to become a Christian Education Director and grow up to be just like Joani, the Youth &Christian Ed Director in the Lutheran Church-Missouri Synod congregation where we were members. 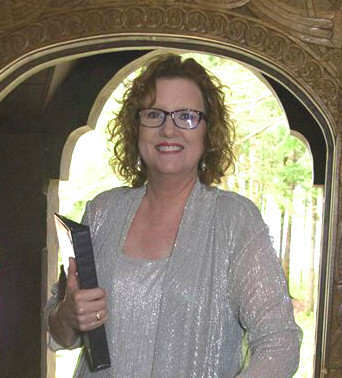 I became very involved in Lutheran campus ministry at college, and one day, the campus pastor, just looked at me and said, “Why don’t you think about becoming a pastor?” Because I came from a denomination that does not ordain women, it took me a few minutes to process what he meant; once I understood what he said, it was a revelation and I saw a light above his head. That weekend I went home, so excited to tell my parents I had figured out what I wanted to do with my life. I thought that maybe they were right, so I double-majored in Psychology and Political Science/History so that I could become a Psychologist or go to Law School. In the Gospel of John 12:1-8, Mary is bumping up against Tradition and The Way Things Have Always Been. What’s going on here doesn’t sound wrong to our 21st century ears, but in the first century, what happened at Mary and Martha’s house would have been the talk of town. For starters, Jesus feet have already been washed. Because everyone walked along the dusty dirt roads in sandals, foot washing was a customary part of hospitality before guests entered a house. The oxen, sheep, horses, donkeys, camels traveled the same roads, so their pungent droppings needed to be washed off sandals and feet as well. Mary and Martha would have already made sure this lowliest of tasks was done before their guests came into the house. So Mary wasn’t supposed to be showing up in the dining room at all, unless to serve. But Jesus had miraculously raised her brother, Lazarus from the dead, and Mary was overflowing with gratitude, devotion and love, so into the dining room she went. To make matters worse, Mary begins touching Jesus as she anoints his feet with perfumed oil. Men and women were prohibited from touching each other in public; in fact men weren’t even supposed to speak to a woman who was not his wife, mother or daughter. Scandal escalates with Mary’s hair loose and flowing which she uses as a towel. Because a woman’s loose hair was viewed as too sensual, it was taboo for a woman to have her hair unbound. We still see this in some religious cultures today—that hair should not only be bound, but covered. • and certainly not by a woman. John offers us the outrageous idea that Jesus, the Messiah, the Anointed One, the Christ is being lavishly anointed for his journey to the cross by a poor, small-town, laywoman, who, in a moment of unbridled devotion, breaks through every tradition in the books. Judas Iscariot gives voice to the discomfort in the room. He pretends to care about the poor as he publicly shames Mary and tries to put her in her place with his supposed male superiority. If you have ever been belittled, shamed or mocked for any reason, you know how awful and uncomfortable Mary must feel. • being active in her body and alive in her senses. Instead of siding with tradition, Jesus joins Mary in breaking down the cultural barriers between women and men, and embodies the radical equality in the Reign of God. 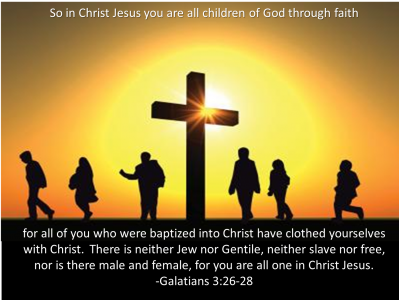 The Apostle Paul affirmed this radical equality in the body of Christ in his letter to the Galatians where he wrote, There is no longer Jew or Greek, there is no longer slave or free, there is no longer male and female; for all of you are one in Christ Jesus. Perhaps your discomfort rises around people who are gay, lesbian, or transgendered. Perhaps it is with refugees or illegal immigrants who don’t speak English, or someone who suffers severe mental illness. Maybe it is with the very poor, who, Jesus reminds us, are always with us due to human greed. 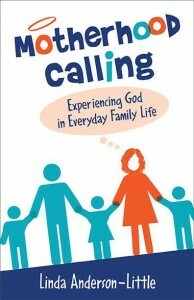 I eventually accepted that my call to ministry was not a momentary delusion, and I did go to seminary. My parents went on a campus tour of the Lutheran School of Theology at Chicago with me. My Dad asked the male tour guide if he was worried that women like me were going to take away his job. He still couldn’t quite see it. But then I went on internship and my parents visited on a Sunday when I was preaching. They came to the Communion rail, the dining table of our Lord. As I served them the blood of Christ, offering Jesus’ radical love and forgiveness, the barriers began to melt away. My supervisor told me that my Dad ducked out of that service before shaking hands because he was all choked up. On the Sunday of my Ordination in 1989, my parents had flowers on the altar of their Lutheran Church-Missouri Synod congregation as if to say, “leave her alone.” After my ordination service, my Dad gave out a “woohoo,” and popped open the first bottle of champagne. Heaven rejoices when, with Jesus, we move through our human boundaries and step into the radical equality in the Reign of God.